Danielle Jonas rose to fame in 2009 when she married Kevin, the oldest of the three Jonas Brothers. Today, the couple is busy juggling life as reality TV stars on the television series, Married to Jonas, while preparing for the arrival of their first child, a girl due February 6. Having a baby can be anxiety provoking enough but having a baby in the spotlight can only add to the anxiety level. During a videotaped interview with Nancy Redd of The Huffington Post, Danielle voiced her dilemma over the anxiety, the pregnancy, and how to cope with it in a way that benefits her without harming the baby. Calling what to do about it a “hard decision,” Jonas chose to continue taking the anti-anxiety medication she’s been taking throughout the pregnancy. She describes feeling calm about the pregnancy at its beginning but the anxiety increased as the pregnancy progressed. The recommendation from the American Psychiatric Association and from the American College of Obstetricians and Gynecologists is to discuss the pros and cons with your doctor before altering such medications. Don’t start taking anti-anxiety medication without consulting first with an obstetrician and, if taking them already, don’t change dosages without your doctor’s directive. The Mayo Clinic acknowledges a risk for birth defects linked to such medications but the risk is very low. Going without them when they are needed could cause more harm to a developing fetus than exposure to the medications would. Taking antidepressants and anti-anxiety medications during pregnancy could be seen as similar to the instructions on an airplane for putting the oxygen mask over the mother’s face before giving it to the children - when the mother cannot take care of herself, she cannot take care of the children. Women experiencing untreated depression or anxiety during pregnancy may not take optimum care of themselves. They may forego eating a healthy diet or getting adequate rest and exercise. Some people turn to alcohol, tobacco, and street drugs to cope with depression, even when pregnant. These risky behaviors could result in premature delivery, low birth weight, and other complications of pregnancy or to the baby. Untreated depression during pregnancy increases a woman’s chance of developing postpartum depression and can make it difficult to bond with the baby. All anti-anxiety medications are not created equal. A trusted obstetrician will know which are best to avoid during pregnancy and which will produce the best benefits with the least amount of worry. Note: Since the publication of this article, Danielle and Kevin Jonas became parents to a healthy baby girl named Alena Rose. She was born on Sunday, February 2. 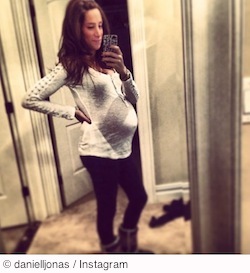 Danielle Jonas: Medication Is Helping Me With Anxiety During My Pregnancy.” HuffPost Parents. TheHuffingtonPost.com, Inc. Jan 25, 2014. Web. Jan 30, 2014. “Antidepressants: Safe during pregnancy?” Mayo Clinic. Mayo Foundation for Medical Education and Research. Jan 10, 2012. Web. Jan 30, 2014.